Thanks to the work of our auction compiler, below you’ll find over a dozen Amish auctions and events taking place in July. States on the list: Ohio, Wisconsin, Montana, Missouri, and Pennsylvania (Update: plus Michigan, and also Ontario). You’ll also see some non-auction events such as the Holmes County Steam and Engine Show on July 31. Note: If you’re planning to attend an event in east-central Ohio (Holmes County area and nearby communities), be aware that an ongoing measles outbreak means vaccinations are in order. Authorities and event organizers have been warning about potential exposure. As always, please let us know about any auctions that should be included. July 2 & 3, Wednesday & Thursday – Annual 2-Day Spring Hill School Consignment Auction, 8 AM, Jamesport, MO. Former Graber Auction, at the Raymond Troyer farm, Original Location: 1/2 mile west of NN & Hwy. 6 Jct. Wednesday all small items, washing machines, lawn mowers, furniture, antiques, you name it. Thursday larger items, buggies, horses. Leave message at 660-684-6006. July 5, Saturday – 8:30 AM. 29th Annual Wautoma Consignment Auction. Quilts and furniture. At Monroe Schmucker farm, 11th. Drive North, Wautoma, WI. Go west on 21 to 11th Drive then north to 1st farm on left. 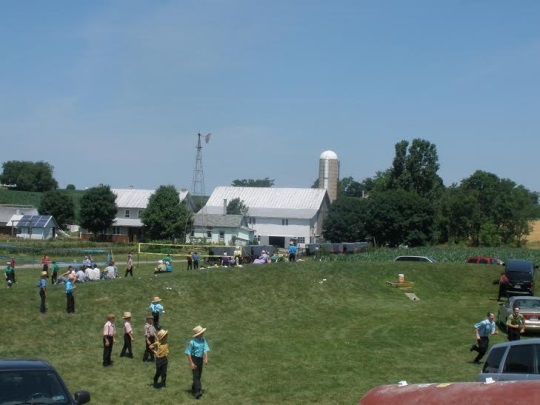 July 12, Saturday – Annual Perry County Amish School Benefit, at Shermans View School, 539 Iron Bridge Rd., Loysville, PA 17047. Held on the second Saturday of July. July 24 – 26, Thurs. to Sat. – Annual Doughty Valley Steam Days, 5025 State Route 557, Millersburg, OH, near Charm. 330-763-0303. July 26, Saturday – Clearview School’s Annual Quilt & Consignment Auction. At Clearview School, W114 Atkinson Rd., Albany, WI 53502. North of Brodhead, WI. 608-862-1340. Held on the last Saturday in July. The Haiti Auction was just held at Penn Yan, NY. I was wondering if there are going to be any other auctions in New York State? Marilyn I am sure there will be, but haven’t seen any for this month yet for NY. Will keep an eye out. 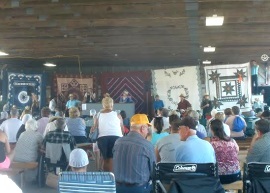 Today, July 12, 2014, I attened the Amish School Auction in Perry County, Pa. I think it was the 37th annual event. I took some pics which I will send to Eric. It was a good time. The Perry County Amish are a bit different. They enjoy inter-acting with the English. The English was the over-whelming attendees at this auction. Hopefully Eric will post some of the pics. Jerry, I did get those pics, thank you. I will plan to share–I really liked the shot you took of the price list breaking down the cost of buggy features. The Amish Crippled Children’s Auction is also on July 5th. It’s in that Auction Grounds right next to Lehman’s in Kidron, Oh. It’s going to be BUSY in the Holmes Co. Area this weekend! Thank you Ann, that’s a nice one to know about. I just added it, with some additional info, to the list. As usual, I hope attendees of any of these events will share photos and experiences. I’m especially hoping someone attends/posts about the consignment auction in Wautoma, WI. I’m currently reading some Amish fiction which takes place in Wautoma, and it would be interesting to see/hear some non-fiction surrounding the town. If I recall, Horse Progress Days also yielded some interesting photos/posts in years past! Thanks, Erik! Maybe, someday, I’ll attend one of these events. There are so many interesting sounding ones! At the annual Mission Valley School Auction in St. Ignatius, Montana, Lorene Yoder’s Mayflower quilt sold for $1,150. Really appreciate your listings of auctions. Thanks. I’m glad the auction compiler continues to submit the monthly listings of auctions and hope it continues. It is much appreciated. This is a good resource, thanks to Erik and the contributor for putting this all together. As I read this on Tuesday, July 01, 2014, it is Canada Day and Friday will be The Fourth, so well wishes all around, even if, as we know, the Amish and plain people are muted on the whole scene. But anyway, when events such as these auctions (or if they correspond with national observances) it’s a lovely thing. Shom, happy belated Canada Day, and just to let you know our compiler sent in some additions which I’ve updated the post above with, including a very large auction in the Milverton, Ontario settlement on July 19, which apparently gets around 10,000 attendees. at the intersection of State Route 534 and 87. The Ox Roast is the volunteer fire department’s main fundraiser and relies on the proceeds generated to purchase essential equipment and gear for the department. The 17th annual Amish Quilt and Craft Show presented by Jacksonport Craft Cottage takes place from 9 a.m. to 5 p.m. July 10 through 13 in Jacksonport, Wisconsin. However, I am not familiar with Amish living in that vicinity. In Lancaster County, Pennsylvania, an upcoming quilt auction will be held on July 15, 2014, at Hometowne Quilt Auction in New Holland, PA. They have an auction six times a year. Good quilt auction during Yoder Days Events in Yoder, Kansas. Will be August 23 this year. I bought an unusual one last year, “Sunflowers and Spider Webs” in a light green top, white back for $700.00. Year before, bought a favorite, one of my cousins made called a “Bordello Heart” its a queen size, paid $550.00. Also few years back bought a log cabin design in navy and white king size from another cousin, paid $750.00. Great quilts, incredible handiwork. I think very good prices. That said, Bordello Heart IS an interesting name for a quilt! Ha sorry Bargello. Didn’t know there was such controversy. My cousin Alice probably doesn’t know either…so I’m sure it would not matter. Anyway, looked it up on the internet for photos and I like my color combo the best! little red, little pink, three shades of blue….all in and faded around the heart. Cousin Alice has a great eye for color. The article, “Auction to benefit Amish school,” which describes the upcoming Clearview School 18th Annual Amish Quilt and Consignment Auction in Albany, Wisconsin, also lists local Amish businesses. “Miller’s sons and daughters work at the area businesses and her husband runs Bill’s Country Sawmill at N5293 Highway 104, Albany. Maple Lane Woodworking, 18250 W. Hafeman Road, Brodhead.